Cruise ship chefs jobs involve the knowledge of numerous cooking methods to whip up the wide variety of dishes served on board. Thousands of meals are made to satisfy every taste, from thin crust pizzas to grilled chicken, slow-cooked roast and delicious deep-fried donuts. Shirring is done mainly with eggs, typically cooked in a dish called a shirrer. However, these days, they are cooked in any glass or ceramic dish with a flat bottom. The method involves baking the eggs in butter until the albumen turns opaque but the yolk stays runny. Shirred eggs are most commonly eaten for breakfast or brunch. This is a method of slow cooking chicken breasts using low temperatures to heat the meat from the outside in. Oil or butter is poured into a pan so it covers the bottom evenly. Medium high heat is turned down to medium and flattened chicken breasts are cooked on one side for a minute before the heat is reduced to a simmer and the chicken flipped over to cook for about 10 minutes. During this time, the chicken is covered and cooked using the trapped heat. After this, the dish is taken off the heat, but left to sit still covered for an additional 10 minutes to finish the process. A bain-marie is a water bath in an oven, using fluid in between two dishes to heat the food gradually and gently. A great variety of dishes can be cooked in a bain-marie, particularly custards and cheesecakes as this method of cooking prevents it from crusting and cracking on the top. Bain-maries are also used to melt chocolate, thicken condensed milk for desserts and make delicate sauces such as hollandaise and beurre blanc. 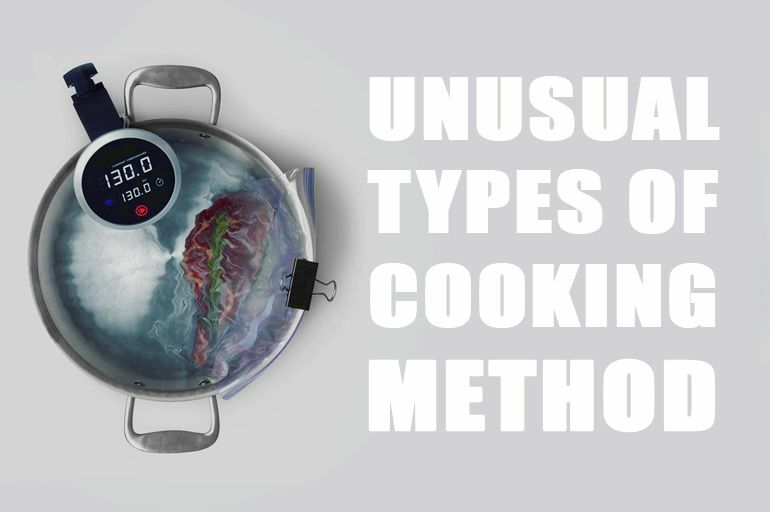 This cooking method uses accurately controlled, low temperatures to cook food over an extended period of time. The produce or meat is generally vacuum sealed in a plastic bag or glass jar and placed in a water or steam bath where temperatures vary between 55 degrees C to 60 degrees C for meat and a little higher for vegetables. Sous vide cooking locks in the juices and aromas of the food being cooked resulting in flavourful dishes which retain moisture and are cooked evenly. This entry was posted in Chef Jobs, Cuisine, The Galley and tagged accla, Cooking Style on September 29, 2018 by admin. Studies show that global consumption of wine is increasing. In the US, imports of rosé from France grew as much as 4,852 per cent since 2001, according to food industry analyst Food Dive. With many cruise ships ferrying US passengers, this trend is sure to find its way on board as well. As such, it is important for those with cruise ship jobs in the food and beverage section to know the wines being served on board, and what to pair them with. 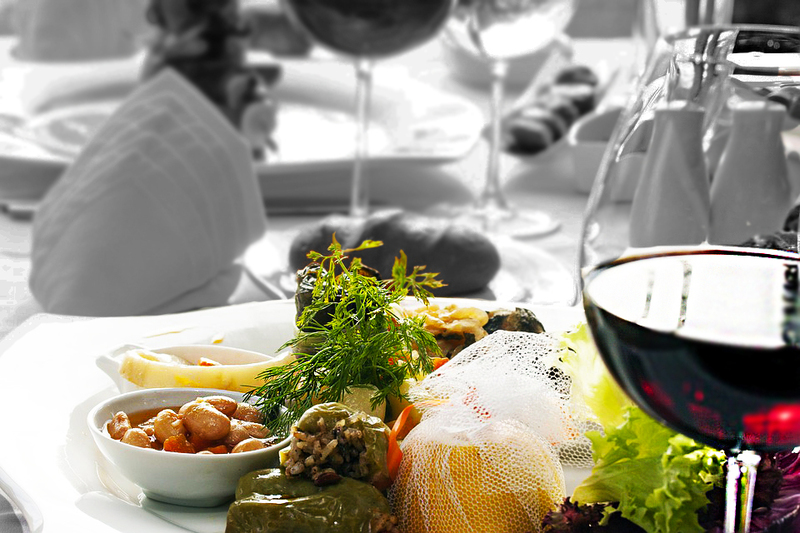 Commonly, wine is divided into red and white, but as cruise ship chefs would know, there are five basic types. Let’s look at each with suggested wine pairings. The colour of red wine doesn’t usually come from black grapes as these fruit have a greenish-yellow pulp. The colour and flavour of the wine is extracted from the skin of the fruit. New wines can look a bit purple, while slightly more mature wines turn red, and older wines get deeper to brown. Look at pairing food such as mushrooms and truffles with a Pinot Noir, a hearty steak with the usual Cabernet Sauvignon or Bordeaux red, and Malbec for heavy Asian meat dishes and spicy barbeques. It is the colourless grape pulp that normally goes into making white wine. Black grapes are also used to make white wine, but the vintner must be extremely careful when separating the pulp from the skin. The liquid from the pulp is then allowed to ferment completely to make dry wine or only partially for sweet wines. Go with Chardonnay for a meal comprising fish in flavourful sauces, but if there are tangy elements to the dish choose a Sauvignon Blanc instead. You could also pick something a little more region specific like Portugal’s Vinho Verde or Spain’s Verdejo. For lighter flavours choose a Chablis, Arneis or Pinot Grigio. To make rosé, a vintner uses only a small amount of dark grape skin, enough to lend colour and a hint of flavour but not enough to make it a true red. There are numerous ways to make rosé, and a wide variety of grapes from around the world are used for different flavours. It is currently an increasingly popular choice with millenials. Rosé is in fact a great wine for cheeses thanks to its fruitiness. It’s the perfect wine for Mediterranean food. During the summer, suggest Italy’s Bardolino Chiaretto with salads, grilled fish and raw oysters. Guests who prefer slightly sweeter tastes can go with Portuguese varietals that can even be paired with mild curries and rice-based dishes. Sparkling wine is the fizzy variety of wine. Natural fermentation either in a bottle or in a large tank causes a high concentration of carbon dioxide which gives the wine this fizzy quality. Champagne is the most famous sparkling wine, and in the European Union the name is legally reserved for wines made of grapes grown in the Champagne region of France. Champagne is known to pair well with slightly salty dishes, so it’s a great option to offer with savoury hors d’oeuvres including foie gras, smoked salmon and caviar. Use a rosé sparkling varietal such as the beloved prosecco with Asian food and antipasti, or the slightly cheaper cava to go with sushi and tapas. Dessert wines typically have a higher amount of sugar than the others, but its specific categorisation differs around the world. To make dessert wine, vintners either use naturally sweet grapes; fortify the wine with sugar, honey or alcohol; or extract the water content to concentrate the sugar. The go-to method of pairing sweet wine and dessert is to offer an acidic wine for items that incorporate fruit and an intense wine for a strong flavoured dessert. If sweetness is the main element, cruise ship chefs must ensure that the wine is sweeter than the dessert. California’s famous Zinfandel goes well with rich caramel pecan fudge or cheesecake, Hungary’s Tokaji can be paired with cheese plates or sweet cheese desserts, Moscato with raspberry or strawberry desserts, and Moscatel with heavy chocolate ones. This entry was posted in Chef Jobs, Cruise Life, Cuisine, The Galley and tagged accla, wines, wines and their accompaniments on June 23, 2018 by admin. Taking a course in cruise culinary arts is just the start of your career as a chef. It marks the beginning of a long but lucrative professional life in one of the most strenuous industries out there. Cruise ship chefs jobs are among the hardest, considering the hours put in and the physical demands. It helps to know the goal you aim to achieve, for without an aim, it makes getting through the ranks much harder. 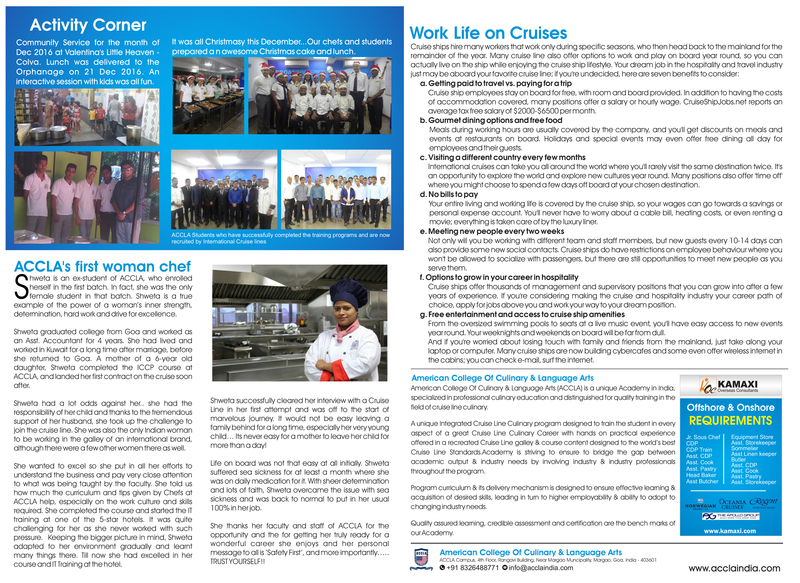 Many of the people you will work with as a cruise ship chef may not have a background in culinary education. They would start at the very bottom of the hierarchy where qualifications and experience are not required. These positions include dish washers or pot washers and galley stewards and cleaners. Other entry level positions within the galley include assistant storekeeper / assistant provisions master who reports to the chief storekeeper or provisions master. For these roles, a knowledge of food and beverage is required as well as accounting. However, if you enjoy cooking and are looking at getting creative, focus instead on roles that can take you far ahead in this line. Fresh out of culinary school, it is advisable to get some experience on shore in a restaurant or hotel. With this, you have a far better chance of getting into entry level galley positions such as baker trainee, pastry trainee, or cook trainee. 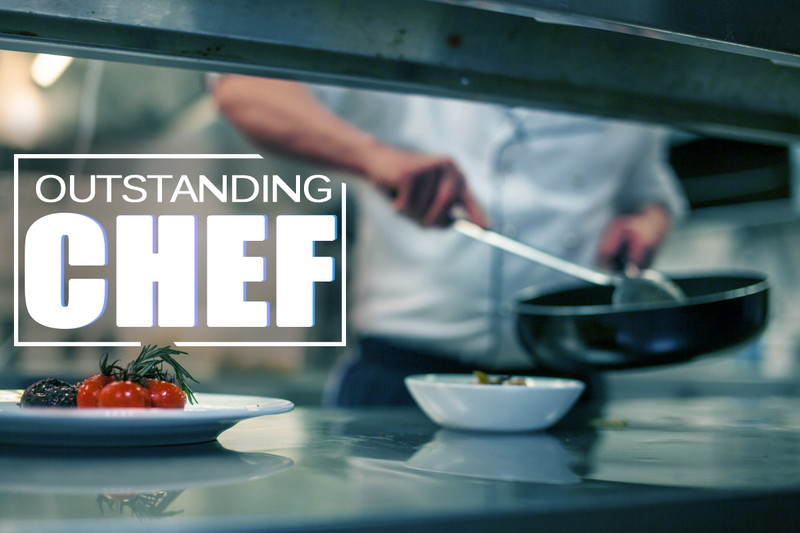 It is here that most chefs either look at gaining experience in a particular sector or get a foothold in the line they are sure they want to pursue. 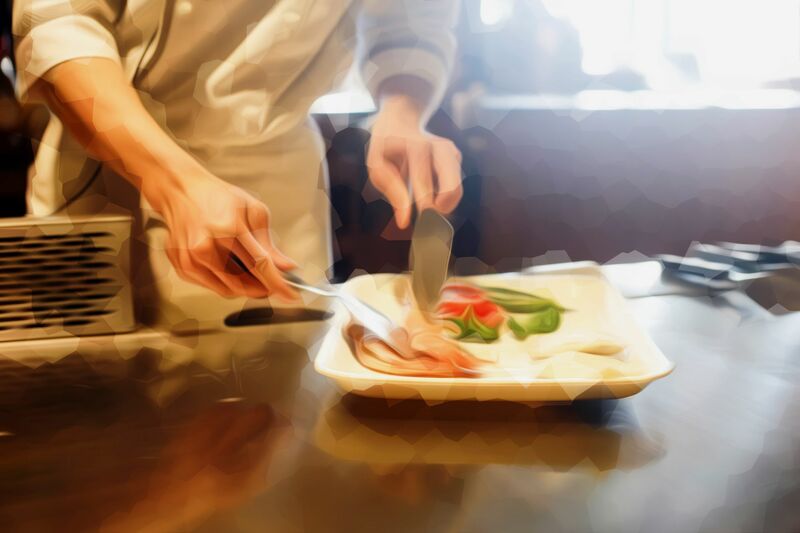 From a cook trainee, you can get promoted to a commis 3 or third cook where you will be in charge of the mise en place, take directions from those in higher positions with regard to food preparation and also explain ingredients and dishes when working in the buffet. Similarly, you can work your way up to commis 2 or second cook and commis 1 or first cook, where your responsibilities get larger and you supervise those below you in the preparation of mise en place. Following this, you will be promoted to demi chef de partie and later chef de partie, the former being an assistant role to the latter. In these roles, you will be responsible for actually cooking the meal according to the menus decided by the executive chef and other management. You will need to understand cooking in volumes and ensuring that portions as well as presentations are all consistent and standardised. 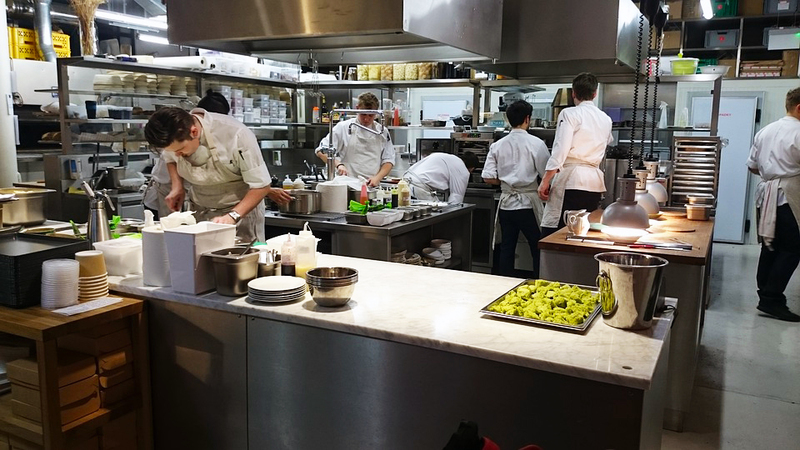 Additionally, chefs de partie need to assign responsibilities to and monitor the performances of entry-level positions to ensure that quality is maintained at all times. At this point, you will be in charge of training new recruits and also assigning their schedules and overtime if any. From here, you will move to a more managerial position in the cruise ship chefs jobs hierarchy. As a sous chef, you will be responsible for the day-to-day operations of the galley. Large cruise ships will have more than one sous chef looking after a particular cuisine or a particular restaurant. It is at this level that quality is cross-checked not just in food but also in service, storage and even finances. A certain amount of training is also imparted by the sous chef, often to chefs de partie for it to filter down the hierarchy. The executive sous chef works with the executive chef to ensure the smooth functioning of the galley. At this level, the menus are discussed and planned, guest inputs are taken into consideration and implemented if desired, and serving arrangements are amended. The executive sous chef also works in tandem with the provisions master to ensure that the galley receives and utilises the best and freshest produce and ingredients in the most efficient way possible. At the very top is the executive chef who is in charge of the entire galley, ensuring that the thousands of guests under his/her charge are well-fed and happy. 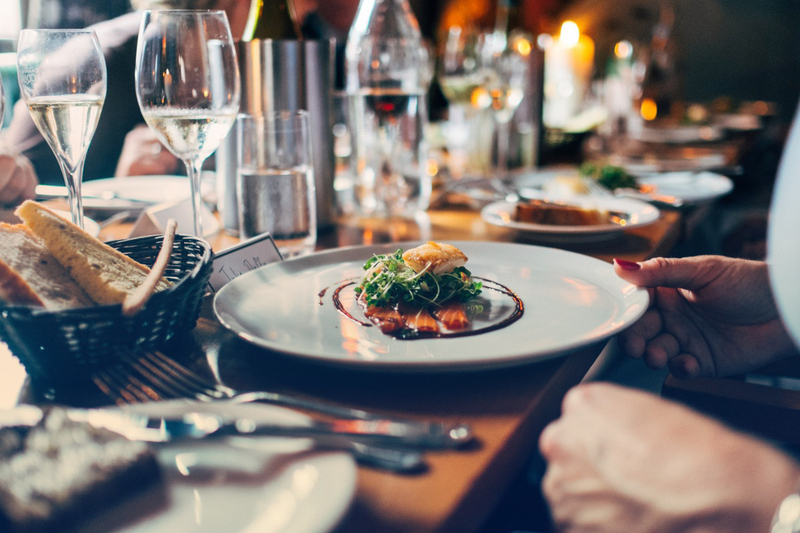 Ultimately, the executive chef is responsible for the final order of food requirements, ensuring everything is in line with the budget, training in public health and safety, and that the food looks and tastes exactly as promised. This entry was posted in Chef Jobs, Cruise Life and tagged accla, career as a cruise chef, Cruise chefs job hierarchy on May 12, 2018 by admin. 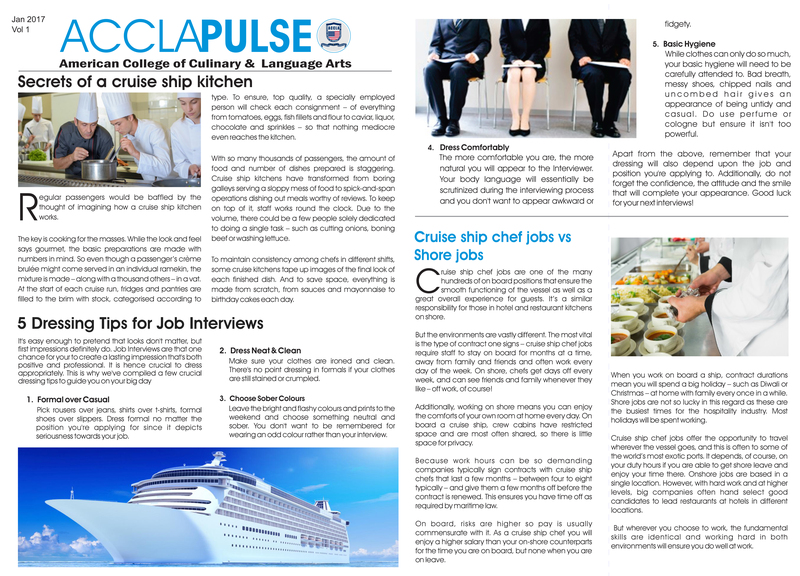 This entry was posted in Newsletters and tagged accla, ACCLA Magazine, ACCLA Pulse, American College Of Culinary and Language Arts on May 5, 2018 by admin. Fine dining is a big part of cruise ship vacations. Guests pack for the occasion and arrive with high expectations. 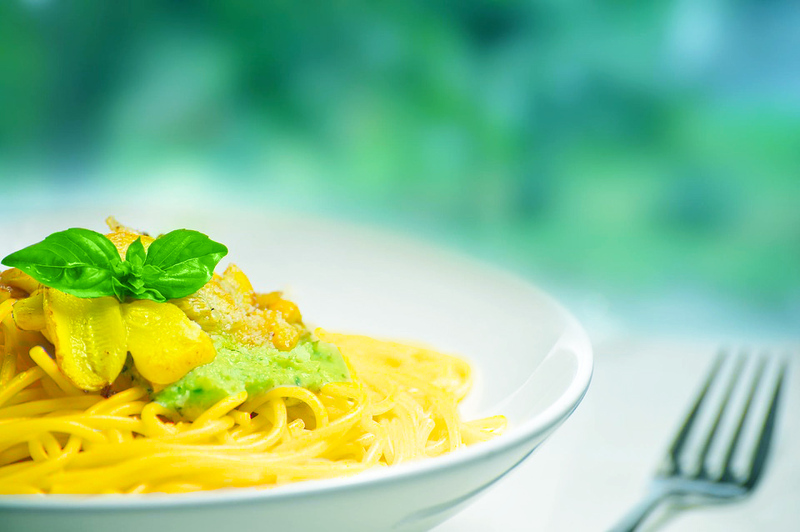 Cruise ship chef jobs that cater to them demand perfection and passion every day. The key to doing well at a fine dining restaurant on a cruise ship is to absorb as much information as you can. It may not be possible to land a cruise ship chef job at a fine dining restaurant on your first contract, but keeping your eyes and ears open will get you there faster. When you have time, speak to the cruise ship chefs who work there and understand more about the demands. Note the importance of presentation and flavour, and how they go together to create a dish that excites all the senses. After all, fine dining is an experience. In between contracts, you can attempt to practice some of the new skills you learnt, or perhaps even pick up new ones. If you get the chance, opt to work at celebrity chef fine dining restaurants – whether on board or on land. The standards are of a completely different level altogether as celebrity chefs have their entire brand hinging on their names. They are not always working at the restaurant but has a head chef in his/her place who has control over the quality of the food. The celebrity chef will come in now and then and make time for staff, so it is good to interact with them and note all the advice they offer. Working at a celebrity chef’s fine dining restaurant can mean very long days but the experience pays off in the long run. On cruise ships, hygiene is paramount. Every cruise ship restaurant must follow international standards for ensuring a clean and sanitised work atmosphere. Failing this could lead to the cruise ship being suspended from service. Some of the basic rules include personal hygiene and correct methods of storing and preparing food. Many fine dining restaurants on cruise ships offer demos and open kitchen meals for a more interactive environment for guests. This makes personal hygiene, kitchen cleanliness and appearance doubly important. 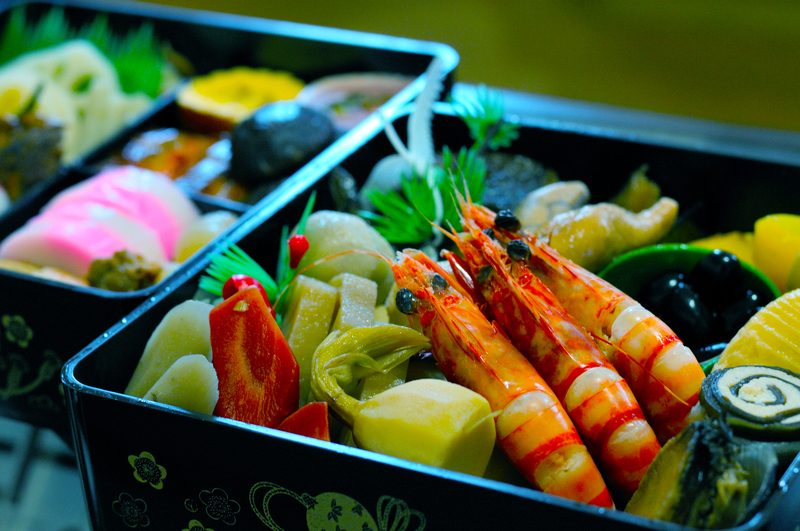 Every restaurant has its go-to dish that guests most look forward to enjoying. As a cruise ship chef at a fine dining restaurant, your job is to learn how to make it perfectly. But that doesn’t mean you should stop there. Go ahead and try to reinvent dishes during your time off. Take a basic and play with it. Some of the most popular dishes at fine dining restaurants on cruise ships around the world include the tuna tataki and miso black cod at Nobu’s Silk Road and Sushi Bar at Crystal Serenity, Silversea’s nine course tasting menu at its Asian restaurant Seishin, Seabourn’s chestnut and porcini mushroom soup with honey-spiced squab-and-fig empanada, 36-ounce porterhouse steaks on the Seven Seas Mariner, and lobster ravioli and osso buco at Disney Fantasy’s Palo. This entry was posted in Chef Jobs, Cruise Life, The Galley and tagged accla, ACCLA India, American College Of Culinary and Language Arts, Fine Dining on April 7, 2018 by admin.